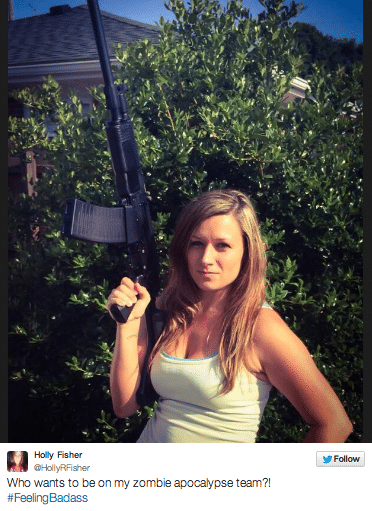 Should liberals be worried by Holly Hobby Lobby? Home Scandal and Gossip Should liberals be worried by Holly Hobby Lobby? 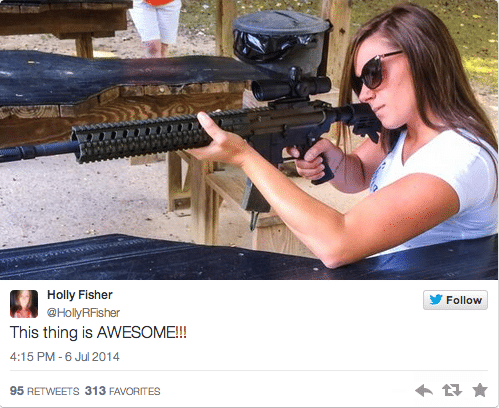 Is Holly Hobby Lobby aka Holly Fisher just exercising her right to voice her views or is she trolling the left wing political divide with the hope of inspiring violence? It seems there is little love lost between those on the left side of the political spectrum and that of new internet/twitter sensation, right wing vanguard, Holly Fisher who goes by her chosen moniker, Holly Hobby Lobby, a West Virginia mother of 3 who has come to rankle the political divide in recent days after the outspoken women has broached her unrepentant belief in guns, disdain for abortion and her views on health care and other political hot issues. First coming into prominence after taking to twitter last week to celebrate Hobby Lobby‘s win in the supreme court which saw the court in a 5;4 vote side with the outlet which sought to be exempted from having to pay the cost of a woman’s contraception on account of it’s religious views which deems such such action a denigration of its religious freedoms as an individual. 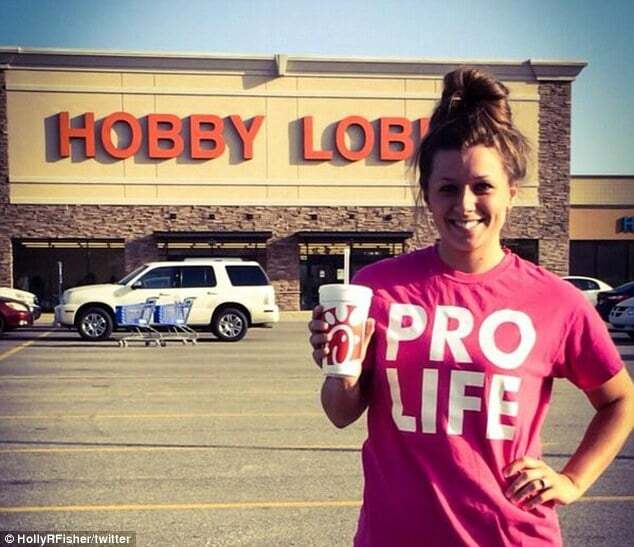 At the time of the ruling the conservative Christian had posted a provocative photo online of her wearing a pro-life T-shirt, while posing in front of a Hobby Lobby store and holding a Chick-fil-A drinking cup. ‘Attention Liberals: do not look at this picture. Your head will most likely explode,’ read the caption on the photo posted on July 1. 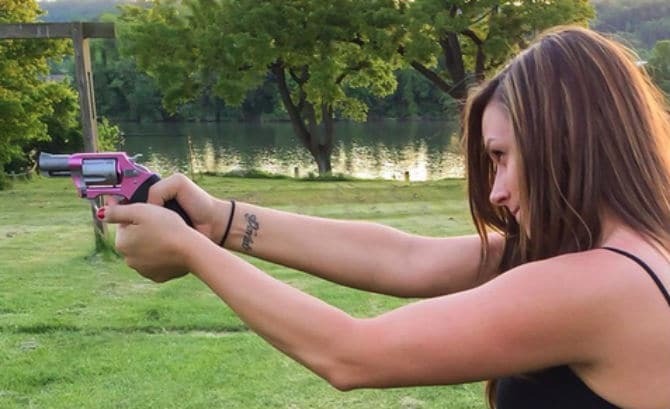 The image went viral, prompting opponents of the Supreme Court’s decision in the Hobby Lobby case to post offensive responses and even make threats against Holly Fisher. Not content with the reaction she had generated, Fisher next posted a photo showing her standing in front of the American flag holding a gun and a copy of the Holy Bible on July 4 (see very top image) in a ruse to mock President Obama’s cling to ‘guns or religion’ comments. 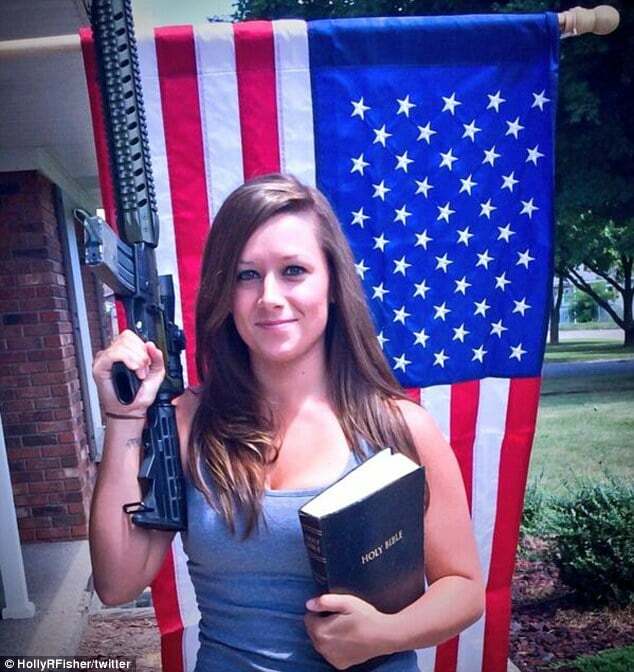 ‘Biggest complaint I’m getting about my #HobbyLobby pic is there’s no gun, bible, or flag. Tried to make up for it,’ she tweeted. As if on cue the twitter posting would lead to overt reactions, to the point that the woman’s twitter post becoming a meme, with many on the political left calling her the American Taliban. 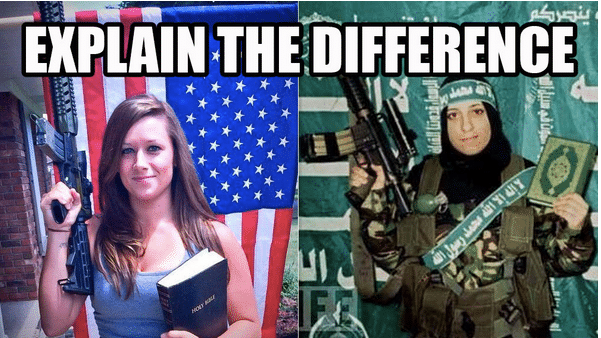 In the meme, Fisher’s photo is side-by-side with an image of Sherafiyah Lewthwaite, an international terrorist known as the White Widow who is part of the Al-Shabaab Islamic militant group. The ensuing trolling between both camps would elicit a variety of reactions from right wing and left wing journals. Contemplated nationalreview: Michael Stone, who blogs over at Patheos under the moniker “progressivesecularhumanist,” is deeply concerned by Fisher’s photograph, suggesting that it renders her the “New Face” of the “American Taliban” and serves to expose “the striking parallels between Islamic and Christian extremists, to demonstrate “the striking similarities between Christian and Islamic extremism,” and to reveal the “romance with religious violence both types of extremists seem to share.” Oddly enough, Stone seems wholly incapable of making up his mind as to quite how Fisher presents a threat to anybody. Pantheos in turn reacted as thus: I appreciated Charles C. W. Cooke’s post distinguishing Holly Fisher from Sherafiyah Lewthwaite, but it suffers from a fatal flaw: It uses reason and logic to rebut an internet meme about anything but. Truth be told, no sentient leftist would feel threatened by Holly Fisher if he met her, but most would be terrified to the point of incoherence by any true encounter with a woman like Ms. Lewthwaite. No, the visual comparison between a peaceful American intentionally trolling the Left and a vicious terrorist is all about shame and stigma, trying to place the Holly Fishers of the world outside the pale of civilized discourse. It’s a very targeted shame, attacking two key instruments of American and individual independence, Holly’s Bible and her gun. If the goal is for women to have the perfect freedom to choose what they believe, and which actions they desire, then it would seem logical to support an independent woman like Holly Fisher who has chosen her own path, even if you might disagree with those choices. Nevertheless irrespective whether one believes in the views that Fisher outspokenly champions, the mother of three has come to find herself receiving death threats. Something that ought to disturb anyone on irrespective of the political divide if we are to believe in the notion that in a democracy one is free to express and champion any view they deem to be true. Which poses the awkward question has the left wing by issuing death threats against a free thinking woman whose views they have come to detest given more legitimacy to an individual who in a previous era many would have laughed at whilst all the while adopting staunch rhetoric that until recently used to the fabled domain of the right wing? The looney lefties should be worried. Her pictures strike a chord with those who cherish what America stands for – and won’t stand for any more of the vicious political tactics the left employs pursuing their agenda. They exposed themselves as the intolerant, hateful, elitists that they are – and have been lampooned beyond credibility by a 22 year old wife & mother of three. No, but she is exposing just how full of s*** the American left when it comes to tolerance and how they view women, gun owners and people of faith. I would say she makes it look easy, but when the left wing sets the bar so low for being full of s***, its not really hard to clear it. Satan’s spawn. And it has nothing to do with what she is promoting but WHO she is – a shapeshifter who plays people.